On April 7th, we announced a new version of Gmail for mobile for iPhone and Android-powered devices. Among the improvements was a complete redesign of the web application's underlying code which allows us to more rapidly develop and release new features that users have been asking for, as explained in our first post. We'd like to introduce The Iterative Webapp, a series where we will continue to release features for Gmail for mobile. Today: Mute. --Shyam Sheth, Product Manager, Google Mobile. One of my favorite inbox triage techniques is Gmail's 'mute' feature. Once I've muted a message, follow-up emails to the conversation bypass the inbox, keeping it clutter free. With mute now available in Gmail for mobile on the iPhone and Android-powered devices, you can quickly manage your inbox while you're on the go. To access mute - select a message and from the drop-down options on the Floaty Bar, tap 'Mute'. 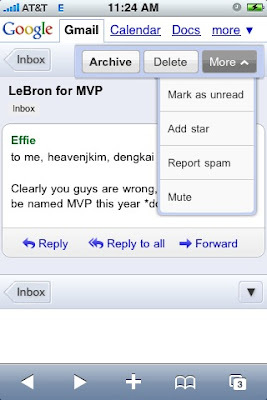 To try mute in Gmail for mobile, just go to gmail.com in your iPhone or Android-powered device's browser. To make it easy to access your account, we recommend adding a home screen link. In the spirit of 'launch early and iterate', stay tuned for more announcements from the Gmail for mobile team. Please note: The new Gmail for mobile supports iPhone/iPod Touch OS 2.2.1 or above as well as Android-powered devices. The new Gmail for mobile is available for English only. Update 4/30/09, 11:19am - This feature is available for US English only. The "mute" feature is cool, I guess. What I REALLY want, however, is labeling and the ability to view HTML emails (none of the images load, and there's no zooming). Oh yeah, and a better "compose" screen (I don't like the way the text fields look - they look to "webby"). Finally, please remove the address bar and the bottom browser buttons (on the iPhone) when someone makes an icon out of it. I agree that labeling really needs to make it to the mobile app. Hopefully the mobile app can incorporate the "move" functionality as well. That update on the full web client really changed the way I interact with my email (well that and send & archive). And don't forget, on Windows Mobile devices the WebKit-based Iris Browser can render these iPhone/Android sites correctly also. Do you mean English (US) or English (US and UK) by that. Testing right now on my G1 with an English (UK) gmail I still don't get the new UI. Yes, my Nokia 5800 XpressMusic has a large touchscreen and a webkit-based browser, and can correctly render most iPhone-specific websites. It would be great if I could access this from that device, via a special URL or something, rather than limiting it with the autodetect method to only iPhones or Android-powered smartphones. Why only iPhone and Android? When are we going to get these similar features on the Blackberry Gmail app? I'm still waiting for BB offline access. Even copy/paste for gmail on BB would be nice. I use the GMail app on my Blackberry Storm, so mute isn't available. On a device with a keyboard, you can hit the m key to mute a conversation, but using the soft keyboard on the Storm doesn't work, for some reason. It would be nice if they included Mute in the menu, along with Archive. Strangely, I noticed labelling capabilities suddenly appearing on my iPhone GMail app around the same time this announcement was made,... In fact I've been using it for two days now and it's working great. It's odd that they haven't announced it yet, but perhaps they're just waiting for it to be fully rolled out before they proceed with the announcement. Now... what about LABELS and MOVE messages? The Symbian S60 devices can handle the webkit based pages very well. The S60 browser can display and work with the iPhone version of Google Reader perfectly. Please enable these features and the new layout for the S60 browsers too.